In our increasingly dog-friendly society, more and more people are bringing their furry best friends everywhere that the law permits it. However, just because your dog is allowed to be somewhere doesn’t mean they shouldn’t be on their best behavior. 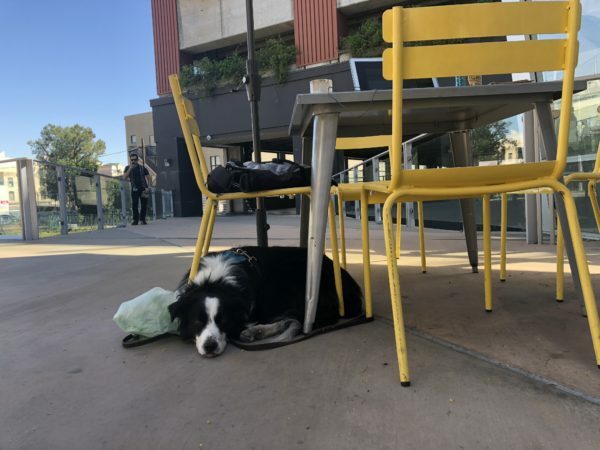 A pup running around and making a ruckus on an otherwise relaxing and fun night on the brewery patio can ruin the mood for everyone. Teaching your dog these behaviors will make every trip out with them easier and impress other dog owners. As a service dog handler, I know all about teaching your dogs the skills he needs to impress everyone at the dog friendly pub, bar, coffee shop, or workspace. A solid leave-it command is an essential for any dog—especially dogs who spend a lot of time in public. Going into heavy-traffic areas means encountering trash, cigarette butts, gum, and abandoned food, all of which could harm a dog if ingested. 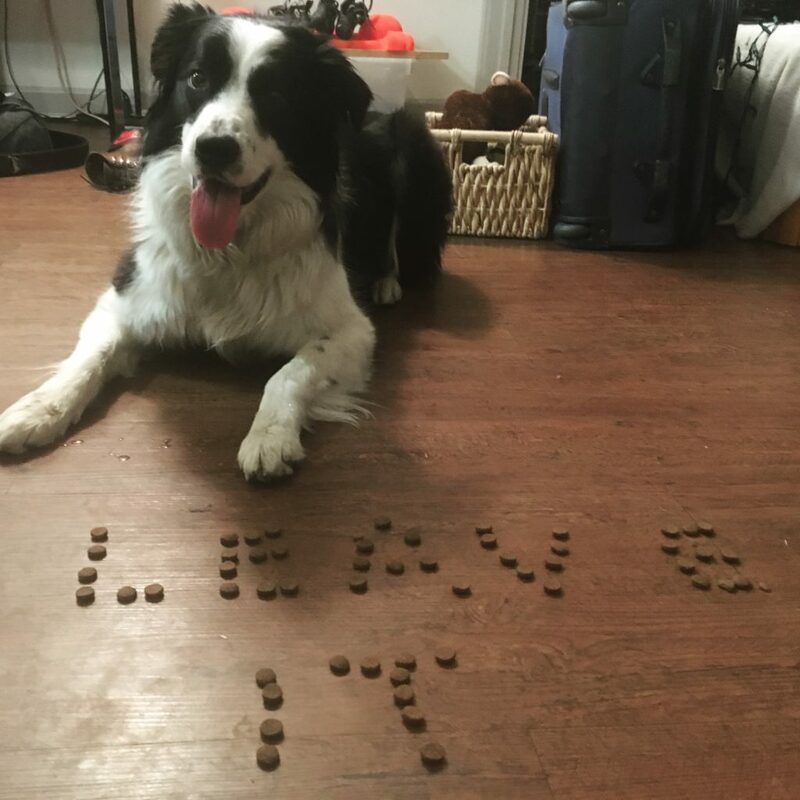 Teaching your dog a leave-it command also improves their impulse control and decision-making skills. Additionally, a quick “drop it!” response is an important skill to teach your dog. With a reliable leave-it you shouldn’t have to use a drop-it command, but dogs are animals, not robots—they can’t be perfect all the time. Making sure they can drop something you don’t want them to have on command is an extremely beneficial behavior to teach. You can start off teaching your dog to “leave it” by rewarding them when they look at you instead of a tempting object like a treat. Hold a treat in the palm of your hand—make sure your dog sees it and shows interest—then close your fist. Wait until your dog stops nosing or pawing at your hand, and when they look at you click or use another positive marker, then reward with a different treat. Don’t use the treat inside your hand or your dog may learn to leave it for only a moment before taking it anyway. Repeat, asking your dog to wait a bit longer each time before rewarding him. Teaching your dog to “drop it” can be started during play sessions. Use two different toys; give one to your dog, and keep the other. Encourage your dog to go for the toy in your hand, and when they go for your toy use a click or other positive marker as soon as they drop the toy they hand. Reward with a treat or play session with the toy you have. Though dog-friendly spaces are often accommodating of the extra room our furry friends take up, sometimes it’s nice to be sure that your dog won’t be the reason someone trips and spills their drink. A tuck command essentially teaches your dog to crawl under tables, benches, and chairs when asked. Teaching a dog to tuck is relatively simple and gives you the freedom to settle in wherever you want without having to worry about taking up space. You can start teaching your dog to tuck with a dining room chair. Guide your dog under the chair using a treat or favorite toy, and click or use another positive marker when they put their head under the chair. Do this for multiple reps, and then try guiding your dog further under the chair. When you get your dog to lie under the chair completely, jackpot with a lot of treats or a play session. You can start adding the cue in no time, and your dog will quickly learn to “tuck” when you ask. Pair with mat training for the best results! Nothing is more frustrating than wrestling with your dog on a walk. 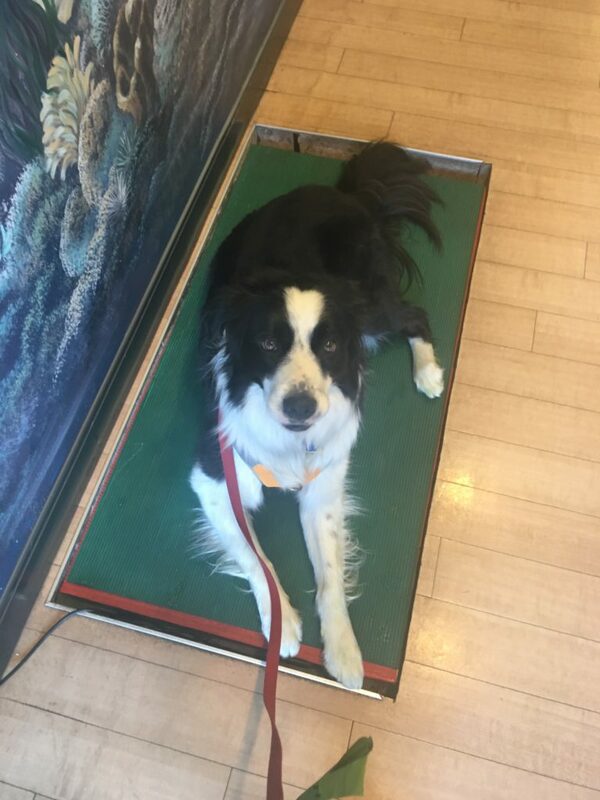 It becomes even more of a hassle when you’re trying to walk through a crowded cafe with a drink in hand, all while your dog forges ahead excitedly. 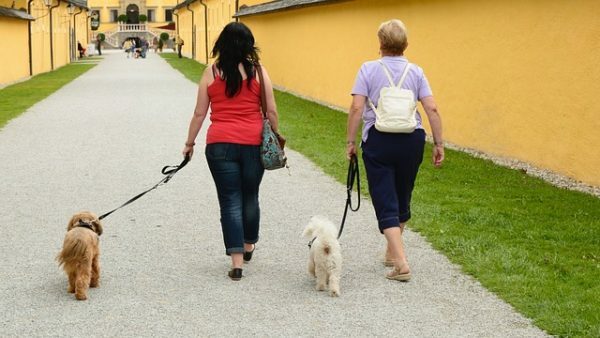 Loose-leash walking is a fundamental skill to teach your dog. Not only does it improve your dog’s behavior on walks, it’s a base skill for training other commands. Start off training loose-leash walking by leashing up your dog inside your home, where there are fewer distractions. Have your dog situated on the side you prefer that they walk on. Take one step forward and as your dog catches up to you, click or use another positive marker and reward. If your dog moves ahead of you, do not click. Once your dog gets the hang of one step, move on to two, and then more. Gradually start practicing in more and more distracting environments. It also helps to use a shorter leash in public. No flexi leads in coffee shops! We use a four-foot leash for city navigation and an eight-foot leash for the suburbs. As some of the most indiscriminately friendly creatures on earth, the majority of our dogs are eager to say hello to as many people as possible. Though it’s not usually an issue, it’s convenient to be able to let your dog say hello and call him back to you once you’re done letting him greet a friend. It can also help to corral dogs who get a little crazier when meeting a friend, and can prevent them from getting too excited and jumping on a stranger. 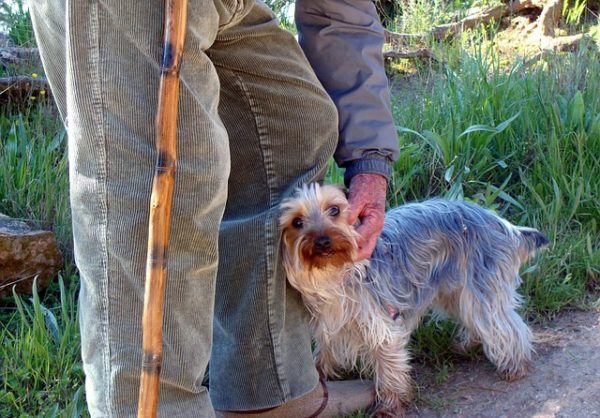 Teaching your dog to greet and return on command requires two basic commands: a release and a focus. If you haven’t taught a release command yet, start off by having your dog sit before you put down their food dish. Make sure they stay sitting until the dish touches the floor, and then say “okay” or another release word as they go for the food. Teaching a focus command is the best way to get your dog to return to you after greeting a stranger. A focus command lets your dog know that your want their eyes on you. Teach a focus command by sitting down with your dog in an area with minimal distractions. Say your dogs name or make a noise to catch their attention, and the second they look at you click or use another positive marker and reward. Practice this when your dog has high chances of succeeding, usually inside the home. Then gradually increase distractions by practicing in the back yard, then the front yard, then a quiet park, then a busy park, and so on. 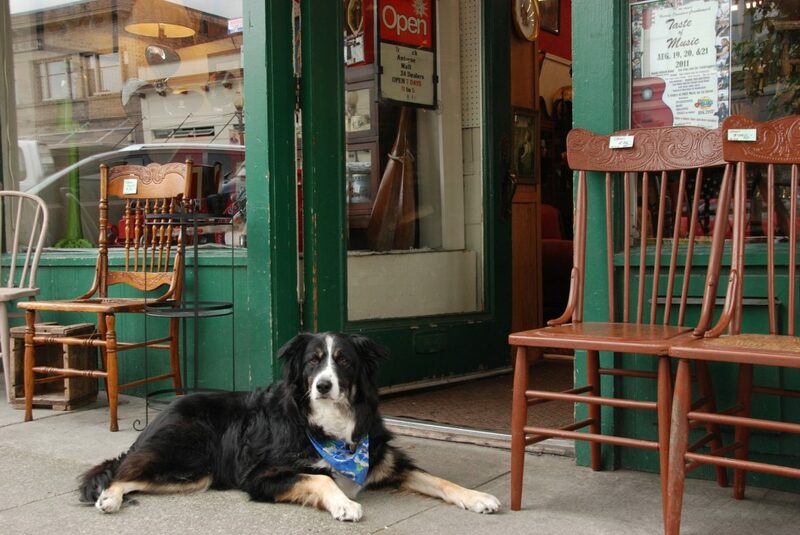 Don’t Go to a Dog-Friendly Restaurant Without It! Being able to tell your dog to go to a certain place and lie down is an absolute gift. Though we enjoy taking our dogs out and about with us, sometimes it becomes frustrating constantly having to watch and parent your dog when you’re trying to have a good time. Teaching a dog to settle on a mat, blanket, or bed is also beneficial in other situations. Trying to get some work done and your dog won’t stop nudging you for attention? Drop a glass in the kitchen and need your dog to get away so they don’t get hurt? Send them to their mat, easy as pie. In a distraction-free space, place the mat or blanket on the ground and wait for your dog to sniff at or step on it. Click or use another positive marker and reward by tossing a treat or toy away from the mat. Give increasingly higher rewards as your dog returns and puts more of their paws on the mat. Once your dog is comfortable standing on the mat, start waiting for them to sit down on it. Then, move on to waiting for a down. Once your dog is reliably lying down on the mat, give it a name—”mat,” “place,” “bed,” etc—and say it every time you click and reward your dog. We’ve got a fantastic play-by-play on how to teach this skill to your dog. Everyone loves spending time with their dog, but sometimes it’s just more enjoyable when you don’t have to babysit them. Check out Journey Dog Training’s 13 Dog Training Games and Exercises to Make Dog Training Fun for great exercises to help bolster your dog’s training and aid in teaching these behaviors.